“Particle Soul” figures by Jonathan Borofsky. ROCKLAND, Maine — Maine’s art scene has a bustling new hub. Rockland, the fishing village with the wide-open skies and attractive, tree-lined main street, once played permanent second fiddle to Portland, one hour and 40 minutes down the coast. But a constellation of new commercial galleries, a swelling community of artists drawn to the town’s more affordable housing, and the recent opening of the new Center for Maine Contemporary Art (CMCA) to complement the more venerable Farnsworth Art Museum have all made Rockland a legitimate rival to its larger southern sibling. Previously situated in a converted firehouse and livery stable in nearby Rockport, the new CMCA opened in a new building in downtown Rockland, just a short block from the Farnsworth. It has a trim, businesslike shape, a glass-and-corrugated metal façade, and a factory-style saw-tooth roof. It was designed by New York-based architect Toshiko Mori, who lives part of the year in Maine. The new building represents a gratifying turnaround for the institution. In 2009, in its former incarnation, it almost collapsed. A new director, Suzette McAvoy, was appointed in 2010. In under six years she has raised $5 million and overseen the opening of the new building, where visitor numbers are expected to increase dramatically. McAvoy’s success is a coup for supporters of contemporary art in Maine — and hopefully also for the state’s artists. Unexpectedly, of the three inaugural solo shows, two are devoted to male artists over 75. The third, however, features recent work by Rollin Leonard, an artist still in his early 30s. Leonard divides his time between Maine and Los Angeles. 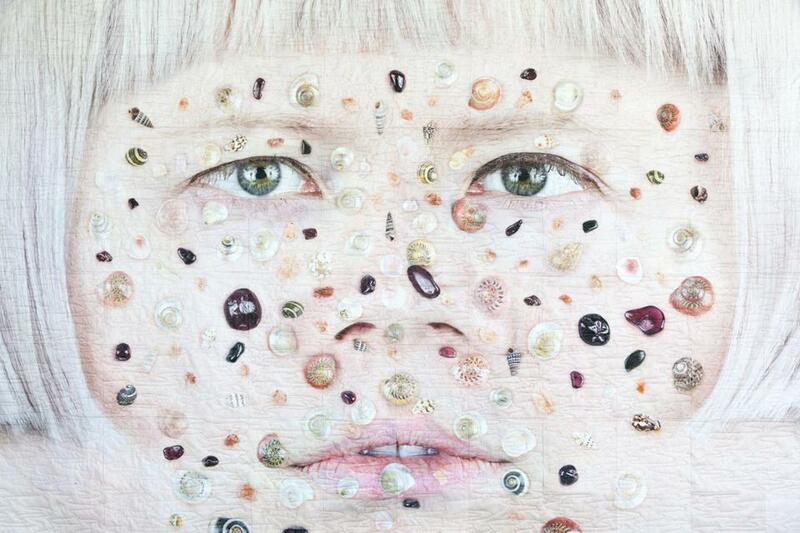 He extends the medium of photography into sculpture, collage, animation, and installation art. His photographs of human subjects mimic the look of Photoshop distortions, but they are for the most part achieved by analog means. He uses stencils and the optical distortions created by water droplets in various creative ways. The resulting images are cut out, coated in resin, and attached to the wall in different configurations. A floor piece in the shape of a human figure, intriguingly, is made from water pooled in circles of different size. The forms are determined by a stencil and an invisible water-resistant substance. Leonard’s work is interesting without being completely convincing. It incites technical curiosity, but it doesn’t yet convince me that the connection among form, technique, and content is as organic and cogent as it could be. The largest gallery at CMCA is devoted to works by Jonathan Borofsky. Borofsky lives in Ogunquit. His glossy sculptures of striding figures and flying men are well known to visitors to the Museum of Fine Arts. Here, his work, in both printmaking and various sculptural media, is likably vibrant and uncouth, but also somewhat toothless. What is it about? What is it trying to do or be? Just from looking, I honestly couldn’t say. The show’s title, “Particle Soul,” doesn’t particularly help, but the repeating motif of cutout human figures linked together to form stacked structures suggests an interest in human communities and perhaps urban environments. They are matched in the museum’s welcoming courtyard by a colorful tower made from 12 such figures, stacked in three rows. Borofsky’s prints are more interesting. Each one shows, in a confident, cartoonish idiom, a vaguely humanoid head or figure marked by biomorphic distortions and surrealistic twists. The figures in the prints are outlandishly individualistic, whereas the stacked sculptures are made from cookie-cutter figures, so Borofsky — in ways that relate, perhaps, to Leonard — may be trying to get at a tension between individuals and communities. But the articulation of his ideas doesn’t feel properly worked out, and the overall impression is of a vibrant hot mess. 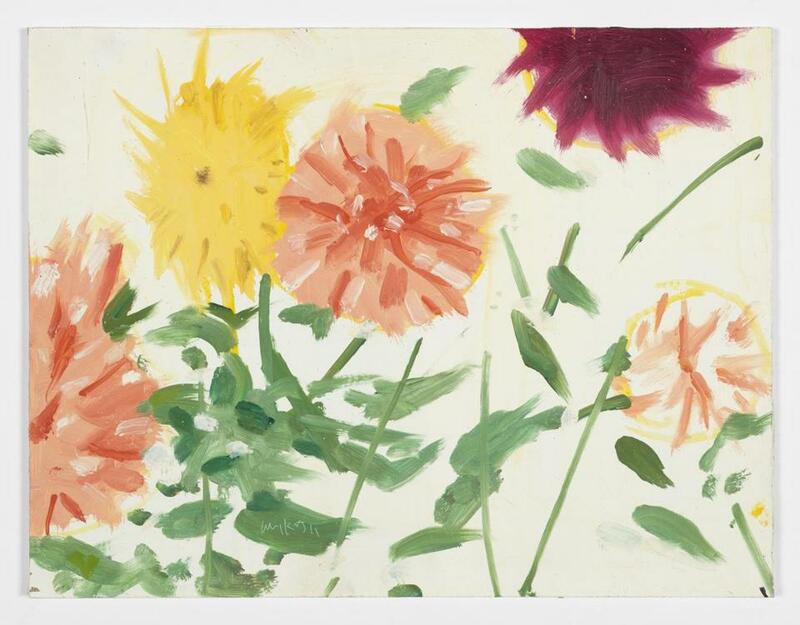 Alex Katz’s “Late Summer Flowers” is at the new Center for Maine Contemporary Art. By far the best reason, besides curiosity, to visit the new CMCA right now is the exquisite show of small paintings by Alex Katz. Katz’s subjects in these works include friends and acquaintances, dusk skies, purple irises, a woman seen from behind, a sun-dappled tree trunk, and upside-down landscapes reflected in water. Katz, who turned 89 on July 24, has been coming to Maine and painting in nearby Lincolnville since 1954. Today the state is studded with examples of his large-scale paintings. You can see them at the Farnsworth; at Colby College Museum of Art, in Waterville; and at the Portland Museum of Art, among other places. What gets lost at Katz’s signature large scale is his intimate painterly touch. It’s only in his smaller paintings that you get the feeling of a hand holding a brush loaded with a quantity of paint and pressed at a certain velocity against a taut, semi-resistant surface in an action that feels qualitatively different at the beginning and at the end. That action is itself just one small part of a unified effort unfolding over time, in shifting conditions, to conjure a stylized representation of the real world that is also a reflection of its maker and a thing in itself. That’s right! And you thought figurative painting was simple. Of course, that’s the thing about Katz: his nonchalance. He makes a virtue, and an aesthetic opportunity, of willed simplicity in the face of ever-accumulating complexity — the precise opposite of what I have been doing these last two paragraphs. Katz is cool. Critics are not. 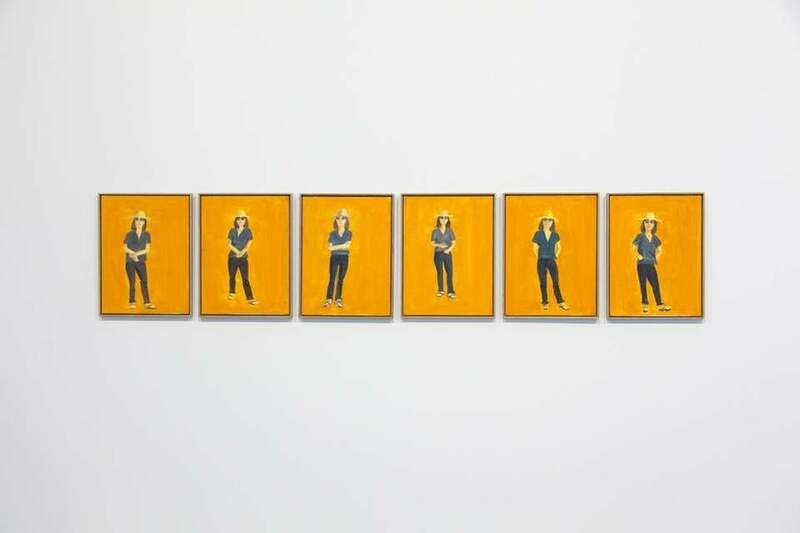 Small paintings by Alex Katz. Small Katz is really the best Katz, and has been since the beginning of his career. You won’t doubt it when you see this show. Over the road at the Farnsworth, which is known for its sterling American collection and its particularly fine holdings of works by the Wyeth family, you can see more evidence of Katz’s impact on art in Maine. A gallery dedicated to contemporary art opened last week, with “Other Voices,” a group show of works given to the Farnsworth by the Alex Katz Foundation. Among the highlights are several absorbing paintings by Nicole Wittenberg, a young painter who was diagnosed with scoliosis as a teenager; Alison Schulnik, who has painted a marvelously scruffy cat; and Francesco Clemente, whose 2002 portrait of his friend the poet Robert Creeley, blind in one eye, is unforgettable. Downstairs, the Farnsworth is showing ambitious print collaborations — many of them taking three-dimensional form — between printer Donald Saff, the founder of Graphicstudio, and leading postwar artists such as Robert Rauschenberg, Roy Lichtenstein, Jim Dine, and Nancy Graves. It’s well worth seeing, as is the first-rate exhibit of N.C. Wyeth’s splendid large-scale paintings in the nearby Wyeth Center. What’s most impressive about Rockland’s burgeoning art scene is not just its embrace of the contemporary, but the willingness of its two major museums to honor progenitors and (without being prescriptive about it) to see contemporary art as part of a continuum, rooted in a sense of place.